English, Henry II, AD 1154 to 1189. Silver tealby penny. Mossop plate coin. Denomination : Silver Penny. Mint and Moneyer : Lincoln, Raulf. 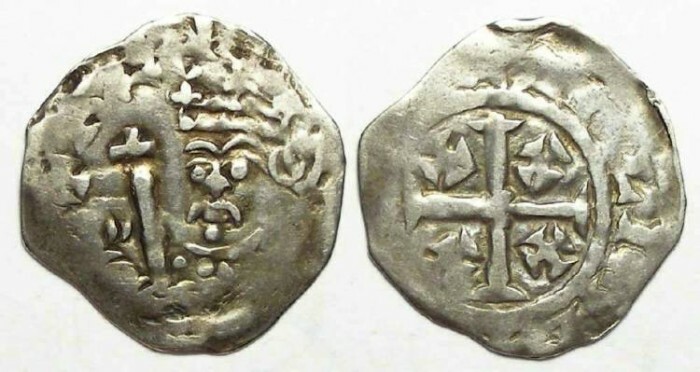 Date : Class C2, issued between AD 1162 and 1167. Reference : Spink-1339. This coin is illustrated in "The Lincoln mint, c890-1279" by H. R. Mossop on PL XC, coin #26. Provenance : Elmore Jones collection (as listed by Mossop), sold by Glendinings as part of lot #1440 on 10th April 1984. Size : 18.7 x 20.3 mm. Weight : 1.44 grams. Grade : VF with a fairly typical weak strike as often seen with Tealby types. Obverse : 3/4 facing bust of Henry II, with HENRI REX A around, but about al you can read is the HE. Reverse : Large cross potent with small potent in the angles, with an inscription naming the mint and moneyer. The part of the reverse inscription visible (with difficulty) is AVL ON L which if fully struck up would have read RAVLF ON LINCOLN. This reading is as listed by previous cataloguers who no more about this series than I do.